Necessarily I am interested particularly and especially in the part of the bill which concerns my trade. I like that bill, and I like that extension from the present limit of copyright life of forty-two years to the author’s life and fifty years after. I think that will satisfy any reasonable author, because it will take care of his children. Let the grandchildren take care of themselves. “Sufficient unto the day.” That would satisfy me very well. That would take care of my daughters, and after that I am not particular. I shall then long have been out of this struggle and independent of it. Indeed. I like the whole bill. It is not objectionable to me. Like all the trades and occupations of the United States, ours is represented and protected in that bill. I like it. I want them to be represented and protected and encouraged. They are all worthy, all important, and if we can take them under our wing by copyright, I would like to see it done. I should like to have you encourage oyster culture and anything else. I have no illiberal feeling toward the bill. I like it. I think it is just. I think it is righteous, and I hope it will pass without reduction or amendment of any kind. I understand. I am aware, that copyright must have a term, must have a limit, because that is required by the Constitution of the United States, which sets aside the earlier constitution, which we call the Decalogue. The Decalogue says that you shall not take away from any man his property. I do not like to use the harsher term, “Thou shalt not steal.” But the laws of England and America do take away property from the owner. They select out the people who create the literature of the land. Always talk handsomely about the literature of the land. Always say what a fine, a great monumental thing a great literature is. In the midst of their enthusiasm they turn around and do what they can to crush it, discourage it, and put it out of existence. I know that we must have that limit. But forty-two years is too much of a limit. I do not know why there should be a limit at all. I am quite unable to guess why there should be a limit to the possession of the product of a man’s labor. There is no limit to real estate. As Doctor Hale has just suggested, you might just as well, after you had discovered a coal mine and worked it twenty-eight years, have the Government step in and take it away–under what pretext! generously gives it to the eighty-eight millions. That is the idea. If it did that, that would be one thing. But it does not do anything of the kind. It merely takes the author’s property, merely takes from his children the bread and profit of that book, and gives the publisher double profit. The publisher and some of his confederates who are in the conspiracy rear families in affluence, and they continue the enjoyment of these ill-gotten gains generation after generation. They live forever, the publishers do. The rest of Twain’s testimony can be found at TwainOnCopyright.com. 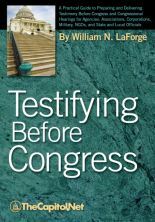 As a practical guide to assist witnesses and their organizations in preparing and delivering Congressional testimony, this book is designed for use by anyone or any organization called upon to testify before a committee of the United States Congress, and for those who are providing assistance in preparing the testimony and the witness. This book can serve as a guide through the unique maze of the Congressional hearings process for virtually any witness or organization, including especially federal departments and agencies, the federal judiciary, members and staff of the legislative branch itself, associations, corporations, the military service branches, non-governmental organizations (NGOs), private and voluntary organizations (PVOs), public interest entities, state and local governmental officials and institutions, and individuals who are chosen to appear as a witness before Congress for any reason on any topic.